In the world of wine we talk about Bordeaux all the time, we all know what we mean by the word. Strangely though I take it for granted and never think about what we do not mean by it. And we do not really mean the city of Bordeaux at all. I have been to Bordeaux quite a few times over the years, but have hardly ever seen the city itself. No, by Bordeaux we generally mean the wines of Bordeaux and the vineyard areas around the city where the grapes are grown and these wines are made. 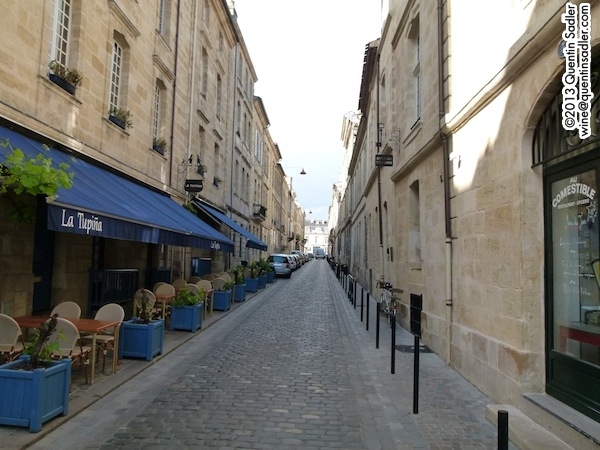 So I was delighted to be invited to spend some time in Bordeaux recently getting to know the city a little and some of the delights that it has to offer the visitor. Bordeaux’s beautiful La Porte Cailhau. 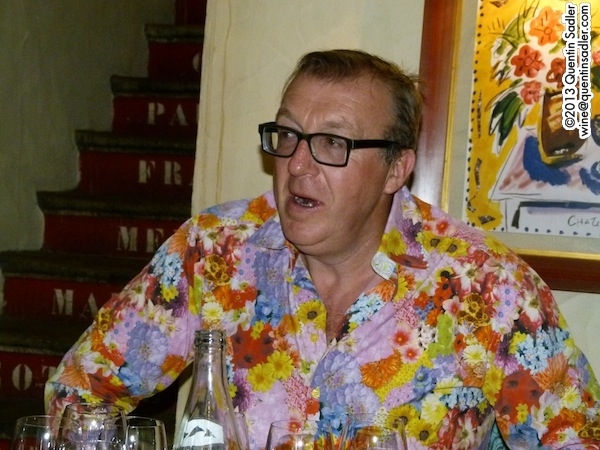 Of course wine looms large in Bordeaux and is hard to avoid, especially – I suppose – as we were guests of Olivier Dauga the larger than life consultant wine maker, style guru and former rugby player. Yes Olivier wanted us to taste his wines and to understand his views on winemaking, but he also wanted us to experience his Bordeaux, his friends as well as the restaurants and bars that he loves. The ever colourful Olivier Dauga – I started to wonder if he always matched the paintings? It was to be a wine visit with no vineyards, wineries or bottling lines. In fact the only vines I saw all trip were the ones that decorate Bordeaux Airport. 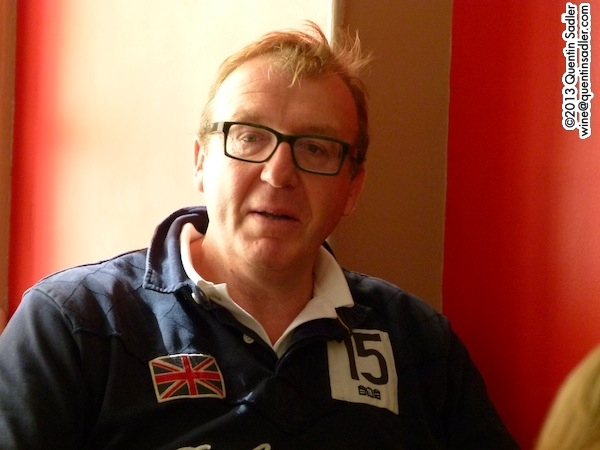 I had met Olivier before, in London, at a tasting of his Ukranian wines and knew that he was a very interesting winemaker and well worth talking to, so I was really looking forward to the trip. Our little group was put up in the lovely Maison Fredon, an arty boutique hotel in the Rue Porte de la Monnaie. It is housed in a beautiful old house and only has 5 rooms, but each one has a distinct personality and is furnished in a different and quirky style. The hotel is the latest venture of Olivier’s friend Jean-Pierre Xiradakis who has been one of the stars of the local restaurant scene ever since he created La Tupina – just over the road from the hotel – in 1968. La Tupina from my window. 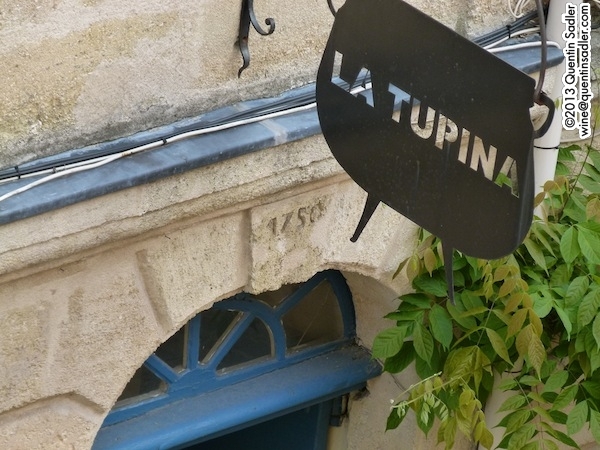 La Tupina is a lovely relaxed restaurant that specialises in the flavoursome traditional food of Bordeaux and the Sud-Ouest. This includes foie gras prepared in many different ways and a wonderful array of grilled and spit roast meats. 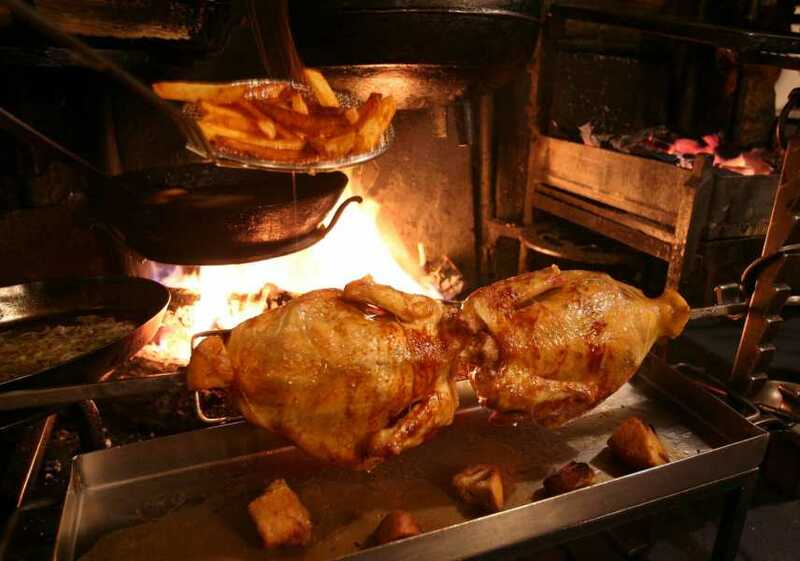 Spit roast chicken being cooked at la Tupina – photo courtesy of La Tupina. Apparently when Jean-Pierre started here the area was pretty run down and considered to be far from the centre. Now he has made the area quite the place to go to for good food. In fact Jean-Pierre calls Rue Porte de la Monnaie the ‘Rue Gourmande‘ as over the years he has created quite a few interesting bars and restaurants here that includes the informal wine bar / bistrot Cave Bar de la Monnaie and Kuzina the Greek influenced fish restaurant – after all Jean-Pierre’s surname is Xiradakis! As if that wasn’t enough the Café Tupina is a lovely neighbourhood bar while the delightful Au Comestible is a casual restaurant and fine grocery store – Jean-Pierre is right, this street really is foodie heaven. Rue Porte de la Monnaie. 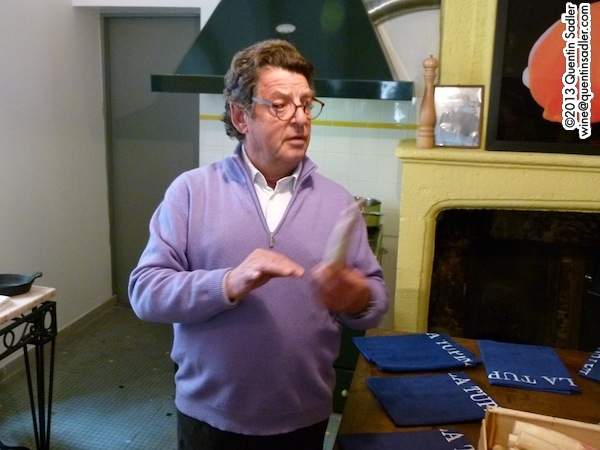 Jean-Pierre showing us how to cook asparagus. 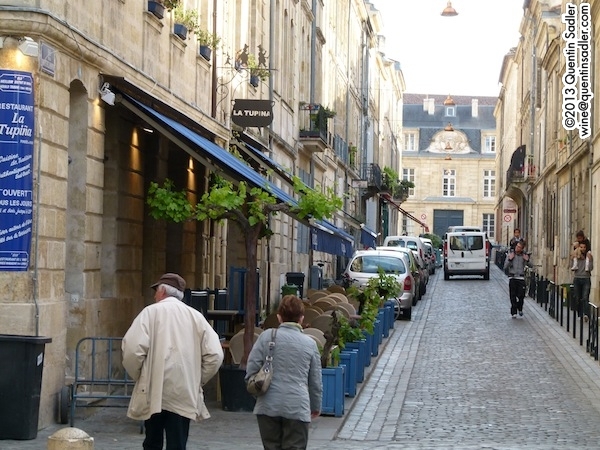 The next morning we were up and ready to explore the city with a stroll around the old ramparts and the lively Marché des Capucins, the historic food market of Bordeaux. 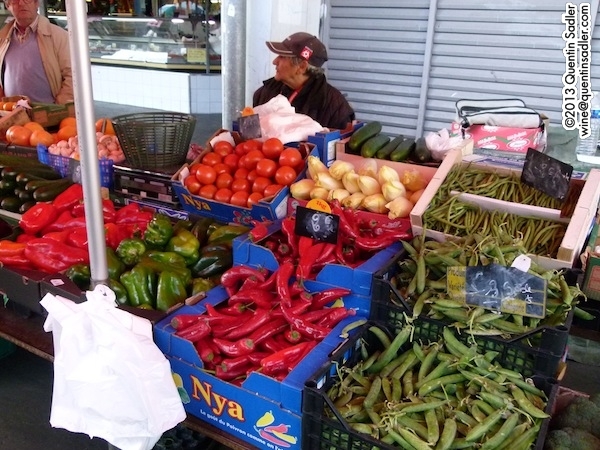 The place is a delight to stroll around with fabulous fish stalls, butchers, charcuterie stalls, bakers, cheese stalls, greengrocers, basque food specialists – and, as is normal in civilised countries, the odd bar to provide liquid refreshment. 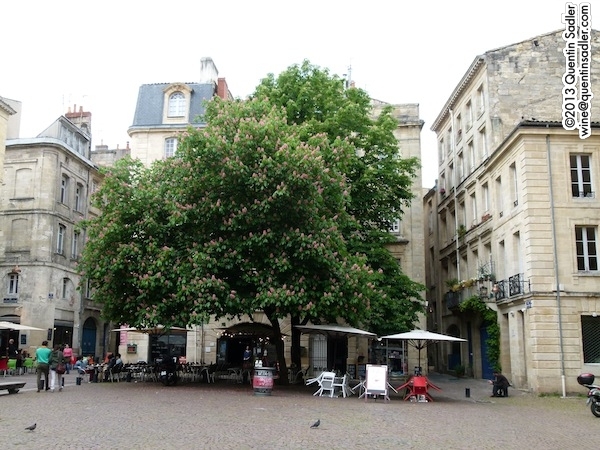 Bordeaux is a terrific city to wander around, the centre is small and so none of the distances seem daunting and there is always something to catch the eye and bring the lovely narrow streets to life, whether its interesting shops, churches, peaceful squares or lively cafés. Our wanderings were not just random by the way, we were touring the city centre and stopped off here and there for a tasting of some of Olivier’s wines. 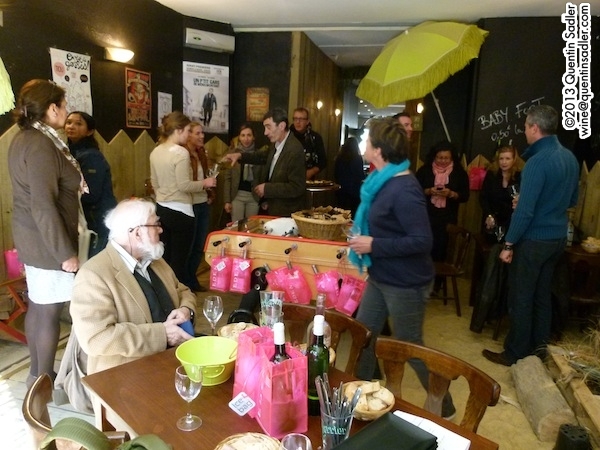 Our first such pit-stop was at one of the city’s many fabulous wine shops, La C.U.V. or Cave Utile en Ville or Urban Wine Shop is a great place to while away a little time looking at the array of bottles from all corners of France and beyond. The original branch is situated in 7 Place Maucaillou, very near the market, the little place has that village-like feel of a place where people actually live and work. So successful have these self confessed inquisitive terroirs lovers been that they have opened a second shop in Place Nansouty, which just goes to show – that contrary to what people think – the French consumer is open to trying and buying wines from places other than their own region and country. In fact one of the things that particularly delighted me about Bordeaux was the vibrant wine shop and wine bar scene with the differences between the two often being blurred. Here we had our first formal tasting of some of the wines that Olivier makes in his role as consultant winemaker. 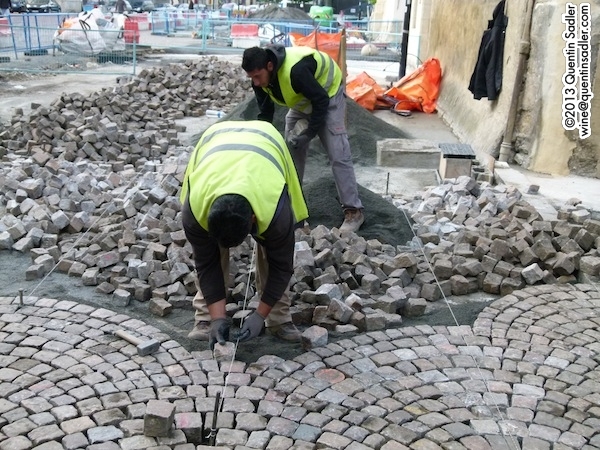 I had spoken to him a little before this and I was very impressed by what he sought to do. It is his intention to respect the wishes of the owner in terms of style and to faithfully reflect the terroir of the estate. He does not seek to impose his own winemaking style on the wines at all and there was a great deal of difference across the wines that he is responsible for. Often you can tell if the same winemaker has made a range of wines, but in these it was nigh on impossible to detect a common style. There was a common thread though, which was fruit and delicacy – none of these were blockbusters, but none were dusty either – which is pretty much exactly the style of wine that Olivier told me he approves of. Simply put he seems to believe that wine should be approachable and enjoyable – and I certainly think those are laudable aims. 65% Merlot, 20% Cabernet Sauvignon and 15% Cabernet Franc. I really liked this unoaked, juicy claret and think it would make many friends who want a good medium bodied dry red that has ample fruit and supple tannins. 86/100 points. 2010 of course was a great Bordeaux year of course, but so was 2009 and you can buy the 2009 in the UK from Stone, Vine & Sun @ £9.75. 40% Merlot, 40% Cabernet Franc and 20% Cabernet Sauvignon. Another unoaked clare that I enjoyed, it has a freshness and fleshy quality to the fruit that makes it very drinkable and pleasurable, especially as the tannins are very soft. 86/100 points. I am told that it is available in the UK from Virgin Wines @ £9.49. 70% Merlot and 30% Cabernet Sauvignon – although Olivier did say there was a drop of cabernet franc here too. This has a little time in oak and it showed with some coffee tinges and fruit cake spice just adding a little complexity to the supple fruit and attractive, clean chalky tannins. 86/100 points. This estate is of course not in Bordeaux, but nearby Bergerac, but this area makes wines in a similar style and offers superb value for money. Jaubertie is famously owned by the Ryman family of stationery fame. 60% Merlot, 15% Cabernet Sauvignon, 15% Cabernet Franc, 10% Malbec with 20% fermented in barrel and the whole wine was aged on the lees for 6 months with 10% aged in new American oak for 6 months. I thought this was a nice wine, direct honest and juicy with a slight oak spice tinge and a delicate herbal green edge to the black fruit. Nicely balanced, very drinkable and utterly classic, but well made – 86/100 points. 50% Cabernet Sauvignon, 45% Merlot, 5% Petit Verdot, 25% aged 12 months in new oak barrels. The extra class and complexity showed here. There was a precision to the wine and a structure to it that made it very clean and taut, but still had good fruit and lovely balance. 88/100 points. 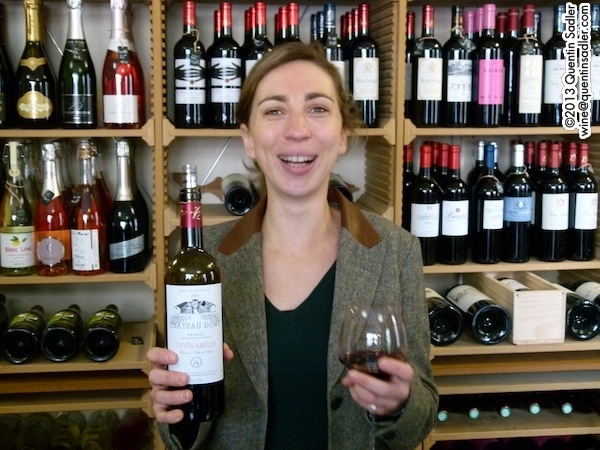 Amélie Durand with her Cuvée Amélie red wine in La C.U.V. 80% Merlot and 20% Cabernet Sauvignon, 45% Merlot, 5% Petit Verdot, 25% aged in oak barrels, one third new. This is the top cuvée from the estate and is named in honour of the owner’s mother, while the estate is run and the wine is made – with Olivier’s help – by the owner’s daughter, Amélie. She was there to present her wines to us and what’s more she drove me to the airport the next day when I had been left behind! I like Amélie’s wines, very much indeed. They have an elegance and a finesse that pleased me, as well as good concentration and balance. The fruit was fleshy and plump while the oak spice was nicely integrated giving mocha notes and complexity. There was a nice cut of acidity too and the tannins were ripe and not astringent – 90/100 points. Having done the reds we set off once more for a stroll through Bordeaux’s attractive cobbled streets to sample some of Olivier’s white wines along with some excellent local seafood at Le Rince Doigt, a casual little place that calls itself a guinguette , guinguette à fruits de mer in fact and it aims to be a seaside seafood bar in the middle of the city. To give that relaxed holiday feel the whole place was dressed up as though we actually were on the beach, with sandy floors and deck chairs and the simple menu was wonderful with oysters, moules frites, moules farcies, spicy cod fritters and much more. The indoor beach at Le Rince Doigt and yes that is John Salvi eyeing the table football! 90% Sauvignon Blanc and 10% Sémillon – no oak, but 3 months on the lees. A lovely beautifully balanced and aromatic dry white bursting with elderflower aromas, green fruit, lemon, lime and salad herbs, the lees ageing has introduced a nice layer of complexity too. A very good dry white, much more interesting than budget Sancerre – 86/100 points. Available in the UK from Stone, Vine & Sun @ £9.75. Sauvignon Gris and Sauvignon Blanc. I liked this bright dry white with its crisp green fruit aromas and slightly fatter smoky palate that reduces the impact of the acidity – 85/100 points. 70% Sémillon and 30% Colombard. Virginie Aubrion makes some lovely organic wines and this relatively unusual white blend is very attractive with real herbal characters, even some lavender, and a nice touch of weight on the palate – 85/100 points. 60% Sémillon and 40% Sauvignon Blanc. Amélie’s white wine was my absolute favourite here and really is fine. It is unoaked, but still has lovely weight and creamy texture backed up by fresh, crisp acidity, this really punches above its weight. Right now it is fresh and lean with crisp mineral acidity with the texture just adding some plushness and creaminess. It will age well becoming richer and creamier – 90/100 points. Rather than have dessert we took some of our favourite bottles with us and strolled down to the Fromagerie Deruelle which is an amazing cheese shop in Bordeaux’s Rue du Pas-Saint-Georges. 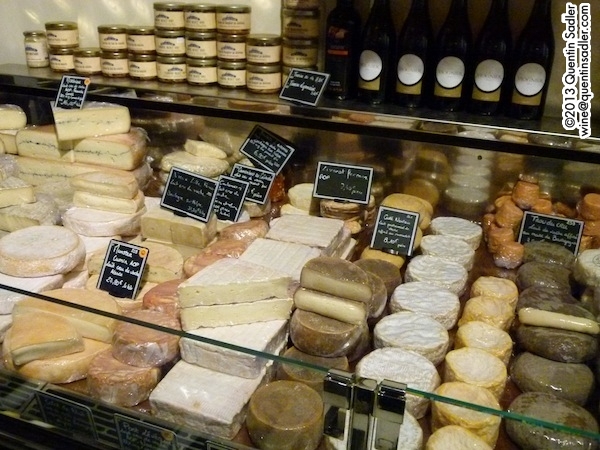 I always love cheese shops, they are truly fascinating places to spend some time – the only problem is they always cause me spend far too much money. Deruelle is one of the very, very best cheese shops that I have ever visited with all the cheeses perfectly stored, all clearly labelled and beautifully presented. 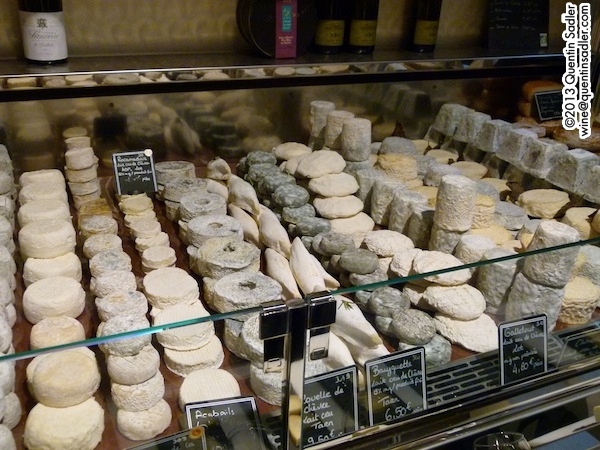 Part of the display at Fromagerie Deruelle. 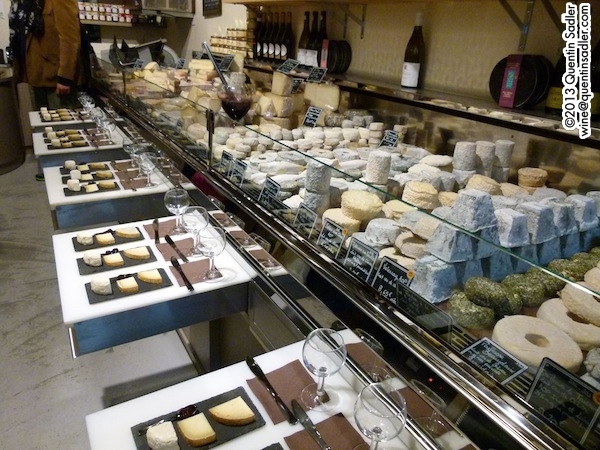 More of the display at Fromagerie Deruelle. Palet Frais – a fresh goat cheese from Lot et Garonne. L’Estive – a (semi) hard sheep cheese from the Basque country. Fourme de Montbrison – is a hard cow’s-milk cheese made in the Rhône-Alpes and Auvergne. In my opinion the 2012 Château Les Combes white was the best with the cheeses as it went perfectly with the first and second cheese, the Fourme seemed to overpower everything really, so needed a really big red wine with lots of fruit. So we were now approaching the end of this wine trip with no winery visits and we finished in one of this lovely city’s trendy wine bars – La Ligne Rouge. Right by the beautiful La Porte Cailhau, La Ligne Rouge is a great place where you can browse the shelves from around the world and buy a bottle to take home or drink there with some cheese or charcuterie. They specialise in artisanal wines, often organic or biodynamic and have a terrific range from across France, especially Roussillon and the Languedoc – Bordeaux wines would seem to be in a minority in their range. Surprisingly they list more wines that come from places other than France and have a great selection from Spain, Austria, Chile, Argentina and much more, so next time you are in Bordeaux drop into this lovely shop…bar…shop – whatever, it’s a great place. Olivier at La Ligne Rouge. This was a wine trip with a real difference and I enjoyed it very much. 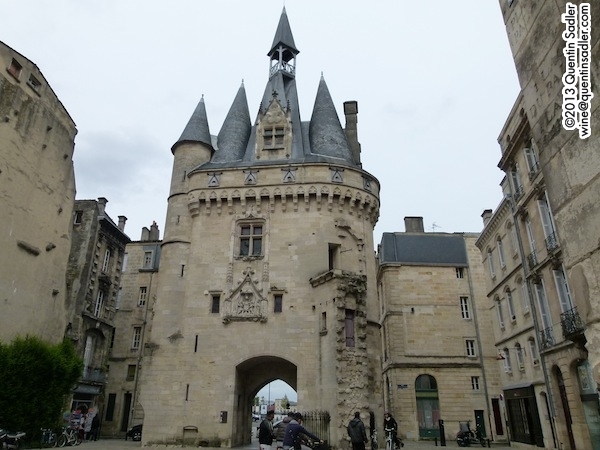 It was very interesting seeing a totally different side to Bordeaux and experiencing for myself what a terrific place it is to stay, to walk around, to eat in and to drink in. 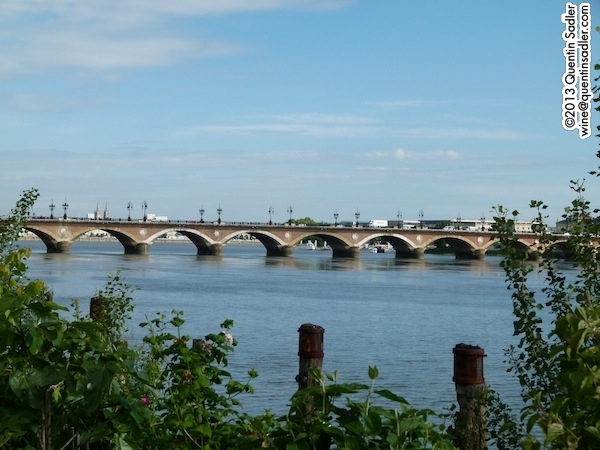 You could do a lot worse than visit Bordeaux for your next break. The other week I had a fascinating experience that was a real eye opener. Some of you will know that I love tasting new things and experiencing wines from unusual places and never pass up the opportunity to taste emerging or obscure wines. It has long been a mystery to me why the old Eastern Block wines have so completely vanished. Twenty odd years ago Bulgaria was a big supplier to the UK and the USSR appeared near the top of the list of nations that made the most wine. Then suddenly they were no more, you will have a difficult search for Bulgarian wine in the UK today and struggle to find the USSR’s successor nations in the list of most important wine producers. As a consequence my experience of wines from this part of the world is very slight, but I have found decent Romanian wines in the past as well as fascinating stuff from Moldova – fine as well as more work-a-day – and most wonderously of all tasted some very old, fine dessert wine from the Massandra Winery in the Crimea. Recently I was fortunate to get a chance to taste wines from two of the leading Ukrainian wine producers and it was a great experience.